This month, we’ll be exploring the role of an Information Architect! Join us as we welcome our guest speaker Julie Grundy, Information Architect at Duke University’s Duke Web Services Team. She’ll go over what her work is like and we’ll dive into a fun group activity! We’re at the American Underground Classroom at the American Tobacco Campus in Durham, NC. The South Parking Deck is closest to the American Underground Classroom. From the South Parking Deck head toward the Strickland Building / American Underground (It’s a big building and there campus signs that will point you to it.). Once in the building take the elevator to the ground floor and head down the hall, where you’ll see an exploreUX / Triangle UXPA registration table. To register for the event, head over to: http://www.meetup.com/exploreUX-raleigh/events/233195500/. We will close the RSVP list by noon on the day of the event. Please be kind to your fellow members and update your RSVP to “No” if you cannot attend the event. We know it’s easier to be less accountable for free events, but we really like to keep these events free to advocate for UX in the community. We really trying to avoid imposing a fee or a 3-strikes policy to hold people accountable. Julie Grundy is an information architect and user experience designer with a passion for aligning UX and business needs. With a background in communications, she brings creativity and experience to craft a seamless user experience that is both efficient and effective. Always with a strategic approach, she works closely with clients to discover project goals and translates them into functional requirements and specs for the development team. Julie is the Director of Communication and Marketing of Triangle UXPA (2015-2016) and co-founder of Ladies that UX Durham. She works at Duke Web Services, Duke University's in house agency. 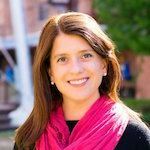 You can find her evangelizing about chunks vs blobs, explaining the beauty of faceted search, preaching about controlled vocabulary, or enjoying one of the many fine restaurants in downtown Durham. This event series is brought to you by exploreUX and Triangle UXPA. The event is co-sponsored by Duke Web Services.